Hello for one more time! Some time ago I had written a post about how to use UITableView cells and make them work as a drop-down list. Anyone who had read that post might understood that when working with UITableViews you can do things more than the usual and common ones, and you can go as far as your imagination and the technology let you go. Indeed, when knowing how to work with UITableViews in a more advanced level, then you can create more flexible apps that make your users happier. So, as you correctly guess, in this post I’m going to work again with the UITableView and to put it in just one, short sentence, I’m going to show you how to display and hide sections on the fly (in the previous post I showed how to display and hide rows of a section). The third cell of the first section will be used as the toggle button that will enable us to switch from the basic info to the extended info and backwards. When being in basic info mode, then we’ re going to have only the first and the last section visible, while the second and the third ones will be hidden. In extended mode all of the sections will be visible. 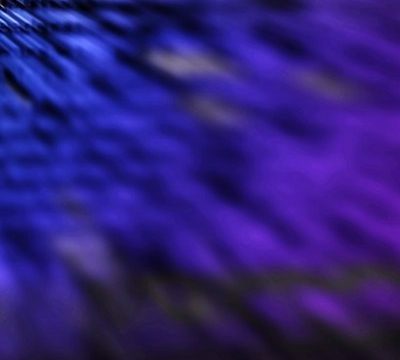 That means that in basic mode we’ll have the name and e-mail info of the contact available, while the rest of the info will become visible/invisible, depending on our will. The initial state of the app will be in basic mode. The big idea behind all this is a BOOL variable, a flag, which indicates whether all sections are visible or not. If that flag (named showAllSections) is YES (true), then all sections and all info will be available. If it’s set to NO (false), then only the first and the last sections (basic info) will be available. Initially, it’s value will be set to NO. Then, when we tap on the switch cell, the third cell of the first section, this flag will be set to YES and the table view will be updated. On a second tap, the flag will change it’s value again and the table view will be updated to hide the extra sections. This functionality will circulate while we tap on the cell to switch state. Let’s go to the implementation. 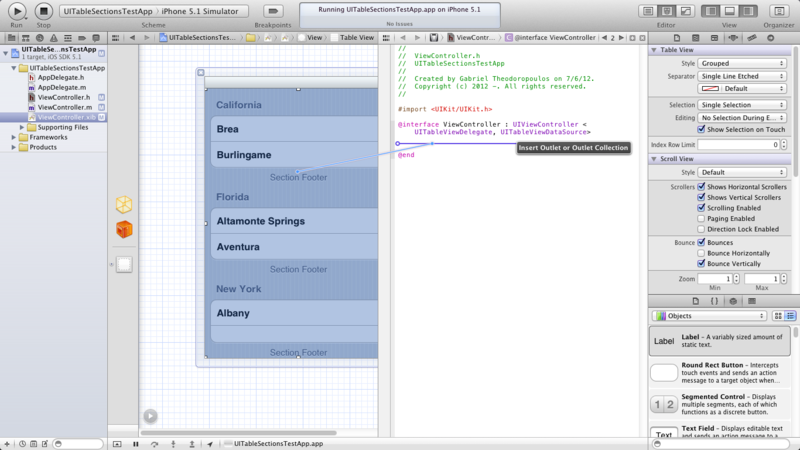 I’m using Xcode 4.3 and iOS Simulator 5.1. You can either implement the project step by step as described below, or you can download it. See at the end of the post. Next, set a name for the app. 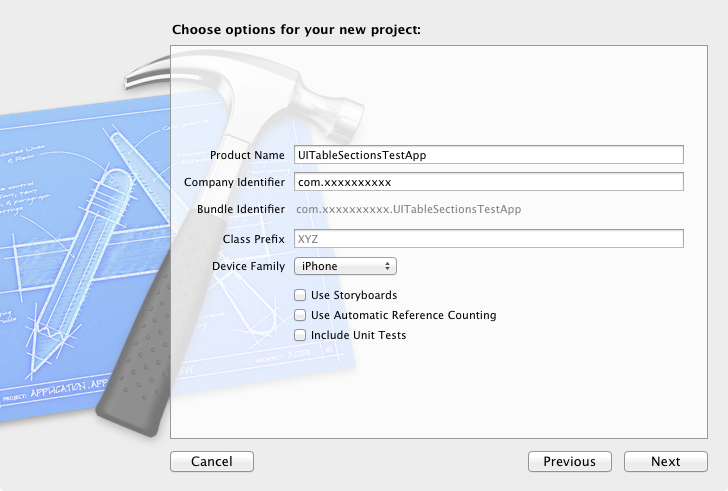 I named it UITableSectionsTestApp. You are always free to name the test projects whatever you like. Finally, choose a directory to save the project and you are ready. In this step we’ re going to setup the interface of the app. The interface is going to be really simple. 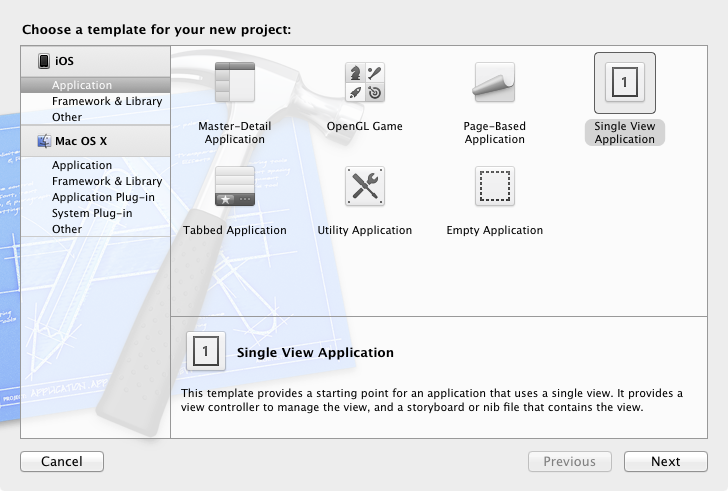 Click on the ViewController.xib file to bring the Interface Builder in front. Add a table view inside the view and you are ready. While being in the Interface Builder, click on the button at the top right corner of the XCode that shows the assistant editor. 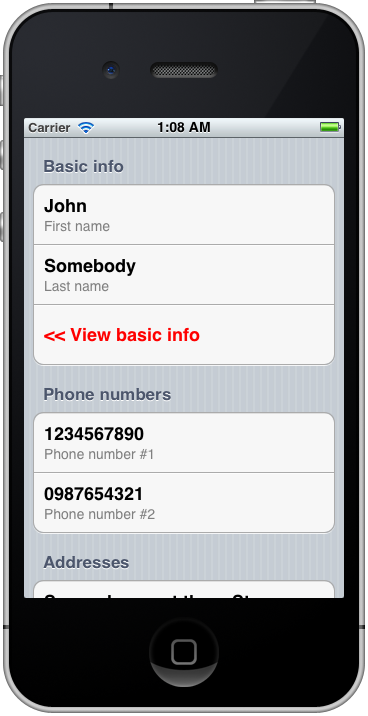 Specify a name for the table view. I named mine table. When using the above method, the Xcode automatically synthesizes the outlet, it releases it and makes the connection. If you don’t want to follow that way, you have to manually set the outlet in the ViewController.h file and then synthesize and release it in the ViewController.m file. Finally, you have to connect the outlet to the table view inside the Interface Builder. No need to get into more details, as it’s out of the scope of this post. Generally, it’s a good practise to keep the data that will be displayed into a table view stored in arrays (NSMutableArray). By that way you can just use the values of the indexPath (row, section) provided by the API and just in a few lines of code to display the correct data each time. Otherwise, you need to check the current section/row and depending on these values to display your data conditionally, which ends up to be a really big mess. In this example, I’m going to use arrays to store the data that will be displayed into the table view. Even more, I’ll init the cells using the subtitle style, so under each cell content there will be a detailed text too. So, apart from the array I’m going to use for the main data of the table view, I’m going to use one more to store the texts of the detailed texts of the cells. For simplicity, we’ll declare all of our objects and any other properties into the ViewController.h file, even though that kind of stuff should be declared into the private section of the interface. The first array named tableData is the one that will store everything we want to be displayed. The second array, named subtitleData, is the array which will keep the texts of the detailed text part of the cell. Earlier, we said that the key to the whole idea is to use a BOOL flag which indicates whether all sections should be visible or not. So, it’s time to declare it too. Now it’s time for the real work. Fill the arrays with contents. Set the table view’s delegate and reload the table view to show the correct data. All these stuff will get implemented inside the viewDidLoad method. Let’s begin. At first, we set the showAllSections property to NO. // so we set the showAllSections to NO. // Init the tableData array, which will contain all the data shown in our table. // Add the contents of the first section as a secondary array. // Add the contents of the last section as a secondary array. // Init the subtitleData array and prepare its contents, in accordance to the tableData array. // Add the detailed text data for the first section. // Add the detailed text data for the last section. 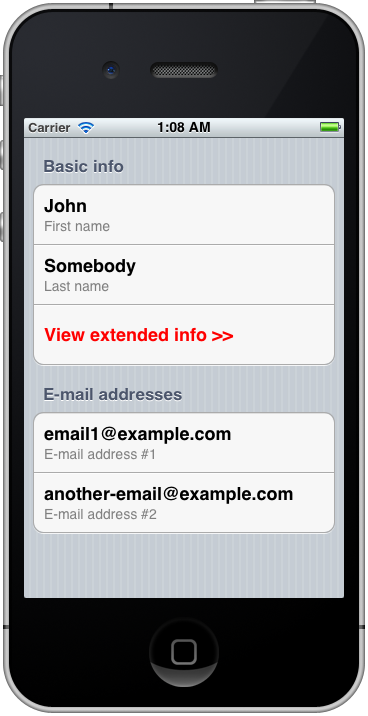 Note that the “View extended info >>” is the text of the cell that will work as a toggle button. This text will change on the fly later. Finally, set the table’s delegate and datasource and reload the table view. // Set the table's delegate. The viewDidLoad method is now complete. Let’s go to implement the table view delegate methods. // If the showAllSections is NO, then we want only two sections. // Otherwise, we want our table to have four sections. Section #1: 3 rows (first name, last name, toggle state cell). Section #2: 2 rows (phone number #1, phone number #2). Section #3: 2 rows (address, postal code). Section #4: 2 rows (2 e-mail addresses). // We don't want our cells to have any selection style. // Format the cell that work as our toggle button. // The "View extended info" cell should have different selection style. When initializing the cell, we use the UITableViewCellStyleSubtitle as the parameter for the initWithStyle option. We don’ t want the cells to have any selection style, so we set it to None ([cell setSelectionStyle:UITableViewCellSelectionStyleNone];). For the cell that will be used as the toggle state switch we specify it explicitly. 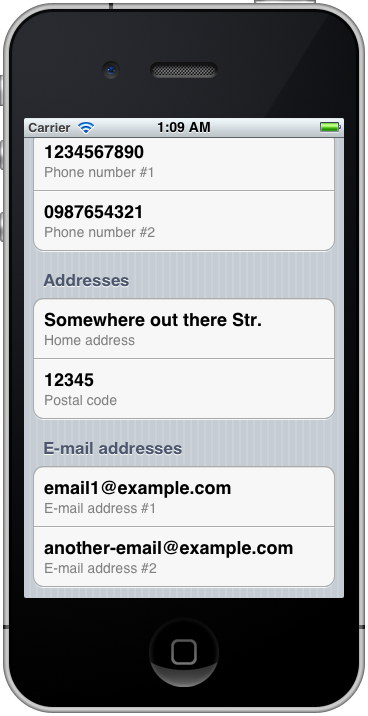 We use the [cell textLabel] and [cell detailedTextLabel] methods to access each cell’s main text and its detailed text. We explicitly set the color of each cell to black to avoid wrong coloring when scrolling the table view up or down. 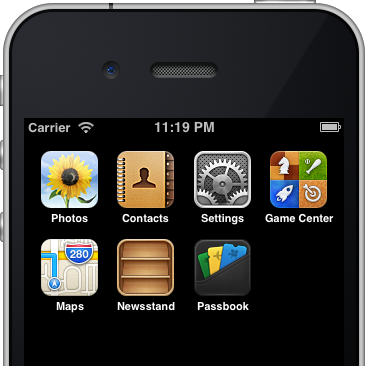 For the cell that will be used as the toggle state switch, we set another color (red color) to make it look different. Finally and most important, we use the indexPath section and row to access the correct data in our arrays. The data values for each cell are stored in two NSString variables. // At first, we need to make sure that only the "View extended info" cell was tapped. // section along with their data into the table, or we'll remove them. // and we should add two more. // Change the text of the "View extended info" to "View basic info". // Remove the two middle sections. // Change the state of the flag.